Italian American Girl: Making Jars of Sauce - What it really means to an Italian American..
Making Jars of Sauce - What it really means to an Italian American..
OK, so now you're saying.. what is she talking about? Now there's a meaning to a jar of sauce? Well, actually yes-- there is. 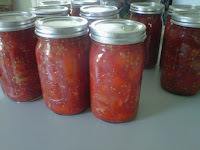 This weekend, I ended up picking tomatoes from my father's garden and making jars of sauce. He's in Italy right now, so in order for the tomatoes not to go to waste, my brother and I teamed up for a little quality sauce time. One of my fans on the Italian American Girl Facebook fan site, said, "You really keep with traditions." It got me thinking, I do what I have to do because its second nature to me to just see that the tomatoes are grown and the logical thing to do is make jars of sauce. But, this is because its part of my family tradition, our family tradition. Really, I posted the picture of the jars on my Facebook page and all of my friends were saying, "who the hell even does that anymore?" Its a lost tradition for many Italian Americans to make sauce or wine, but one thing remains constant in my family, we keep up the traditions. That jar of sauce means more than a good sauce for a great meal sometime in the future, but instead it means I cultivated and preserved one more element of my Italian upbringing. Its true even if you go to Italy you don't find many younger generations partaking in this type of tradition unless you go Rome and South. So, it is rare but a gem. That sauce is my love, my family, my identity and my culture. I posted last year about making the sauce, and it almost seems the meaning with each year gets deeper and deeper. It might be sauce or gravy to you, but in the end its the valuable meaning that becomes common. To me, it's the highlight of the summer to make a base sauce from fresh tomatoes and basil. When winter comes, it is so satisfying to have the sauce over pasta. My mouth is watering! Thanks for your comment! Yes, it really is a satisfying feeling knowing you made that very sauce that's going over your pasta. I love it. Now, I'm in the mood for pasta today, it is Sunday after all.. Ciao! Grazie. Just relocated your blog on my laptop that I rarely use and am so glad I found you again. My southern Italian husband and I live in an Italian/American neighborhood in SE Michigan. When all of us first moved into this new neighborhood in'04 all the Italian ladies were very friendly and taught me much about the Italian lifestyle/cooking and I immediately embraced it as the new wife of my 2 generation husband. I look forward to browsing through your blog again and to your future posts to brush up on my Italian living. I am craving Jersey tomatoes more than anything right now. Your blog has given me the encouragement to try and score some and make sauce. I live about 2 1/2 hours from NJ, so this is no easy feat! Thanks everyone for the comments, I hope you all get to make your sauce. 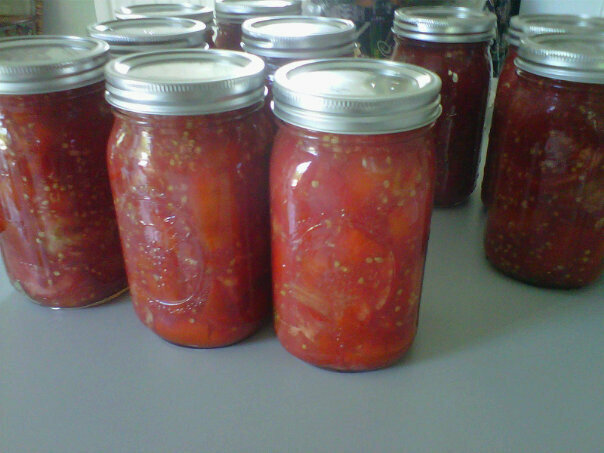 We still have a few more batches to make the tomatoes arent done growing! I love to cook and its always suggested by friends and family that to open a restaurant. Making jars of sauce the traditional way is something I have not yet done.... so I went to the produce market today and picked up a 50lb case of fresh plum tomatoes, fresh basil and 36 "ball" jars. The pictures of the jars of sauce caught my eye. My friend and I started a community garden 10 years ago, so making sauce from my tomatoes is one of the most gratifying things I have ever done. My mother almost cried when she saw my garden. Her father grew the family's food for the year and it gave her so much pride to see me doing the same things. Who knew that it would be a movement to grow one's own food - our ancestors were so ahead of their time and it is nice to see people realize what many Italians already knew. The importance of family being the top priority. I will follow your blog as I plan our first trip to Italy in 30 years! My Mother made sure before she died in 2008 that all 5 her children knew how to can tomatoes. Being the youngest of 5 I really had no interest until 2 years before she past. My polish friend Laurie wanted to learn, so we video taped the whole lesson and made sauce!! I'm so grateful for the experience and this year we canned 129 quarts of sauce! You are so right about our roots and our Italian Family tradition.....So proud and honored to be an Italian -American! !